Ha! Science needs you, dear drinker, to contribute to it's body of knowledge. Go be experimented upon. 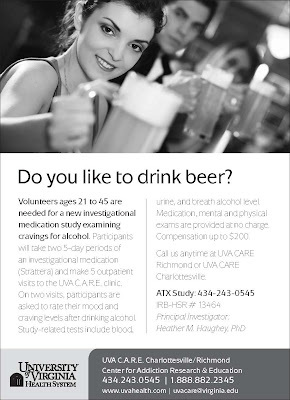 UVA's Center for Addiction Research and Education is looking for people they can pay to drink. Up to $200. That's like a 2000% discount. Best. drink. special. ever. Do you like to drink Beer? investigational medication (Strattera®) and make 5 outpatient visits to the UVa C.A.R.E. drinking alcohol. Study-related tests include blood, urine, and breath alcohol level. Medication and mental and physical exams are provided at no charge. Compensation is up to $200. Principal Investigator: Heather M. Haughey, Ph.D.